Arthur Jones Henshaw1,7,8,9 [Button Henshaw1]. Born Dec 22 18884,6,7,8,10 [Dec 22 18872,9,11], Milan, Jackson County, Alabama4,6,7,8,10. Hinshaw, Authur J., head-of-household, age 32, born in Alabama; parents born in Alabama; rented home; occupation: farm laborer, working out. Hinshaw, Willie, wife, age 25, born in Alabama; parents born in Alabama. Hinshaw, Lester, son, age 7, born in Alabama; parents born in Alabama. Hinshaw, Euna, daughter, age 5, born in Alabama; parents born in Alabama. Hinshaw, Geneva, daughter, age 2 years 9 [unclear] months, born in Alabama; parents born in Alabama. Hinshaw, Authur J., head-of-household, age 38, born in Alabama; parents born in Alabama; first married at age 19; occupation: farmer, general farm; not a war veteran. 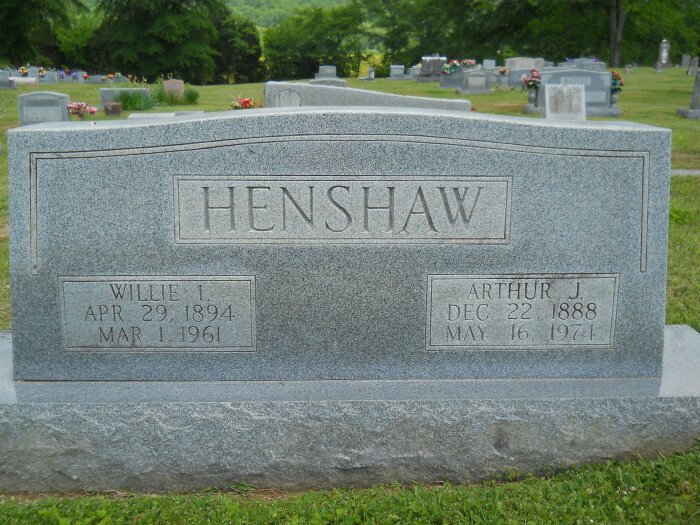 Hinshaw, Willi I., wife, age 36, born in Alabama; parents born in Alabama; first married at age 17. Hinshaw, Lester R., son, age 17, born in Alabama; parents born in Alabama; attended school. Hinshaw, Una J., daughter, age 15, born in Alabama; parents born in Alabama; attended school. Hinshaw, Geneva L., daughter, age 13, born in Alabama; parents born in Alabama; attended school. Hinshaw, Eliza M., daughter, age 5 years 1 month, born in Alabama; parents born in Alabama. Hinshaw, Lewis R., son, age 1, born in Alabama; parents born in Alabama. Jones, Seabron [unclear] A., father-in-law, age 71, born in Alabama; parents born in Alabama; widower; first married at age 22; occupation: retired, farmer; not a veteran. Jones, Georg M., brother-in-law, age 40, born in Alabama; parents born in Alabama; widower; first married at age 24; occupation: carpenter, building; not a veteran. Hinshaw, Authur, head-of-household, age 50, born in Alabama; completed 7th grade; on Apr 1 1935 was living in rural Jackson County, Alabama; rented farm ($5/month rent); occupation: carpenter helper, building; worked 20 weeks in 1939; $145 wages in 1939. Hinshaw, Willie, wife, age 45, born in Alabama; completed 6th grade; on Apr 1 1935 was living in rural Jackson County, Alabama. Hinshaw, Marie, daughter, age 15, born in Alabama; completed 8th grade; on Apr 1 1935 was living in rural Jackson County, Alabama; attended school. Hinshaw, Lewis, son, age 11, born in Alabama; completed 5th grade; on Apr 1 1935 was living in rural Jackson County, Alabama; attended school. Jones, Monroe, brother-in-law, age 49, born in Alabama; completed 8th grade; on Apr 1 1935 was living in rural Jackson County, Alabama; widower; occupation: foreman WPA, bridge work; worked 32 weeks in 1939; $550 wages in 1939. Contribution from Marie Henshaw McCain. 1920 census, Princeton Precinct, Jackson County, Alabama; roll T625-19, ED 40, page 1A, line #1, dwelling #1, family #1. 1930 census, Princeton, Jackson County, Alabama; roll T626-21, ED 41, page 2A, line #4, dwelling #26, family #26. Contribution from Robert Howie Henshaw. 1940 census, Hollytree Prescinct, Jackson County, Alabama; roll T627-41, ED 36-35, page 6A, line #32, household #93. "Paint Rock Valley Pioneers", a directory of Alabama cemeteries by Kittye Vandiver Henshaw, Evelyn Rochelle, and Addie Shaver, F332 P34446 1986, in the Tennessee State Library and Archives; Also 976.195 V3hk in the LDS Family History Library (not on microfilm). Contributed by Robert Worley. 1900 census, Collins Precinct, Jackson County, Alabama; ED 36, page 208A, line #37, dwelling #59, family #59. 1910 census, Princeton Precinct, Jackson County, Alabama; roll T624-16, ED 38, page 70A-B, line #48, dwelling #159, family #159. World War I Draft Registration Cards, 1917-1918; http://www.ancestry.com. 1900 census, Princeton Precinct, Jackson County, Alabama; roll T623-20, ED 44, page 8B, line #51, dwelling #86, family #86. Contribution from Sara Rich ().